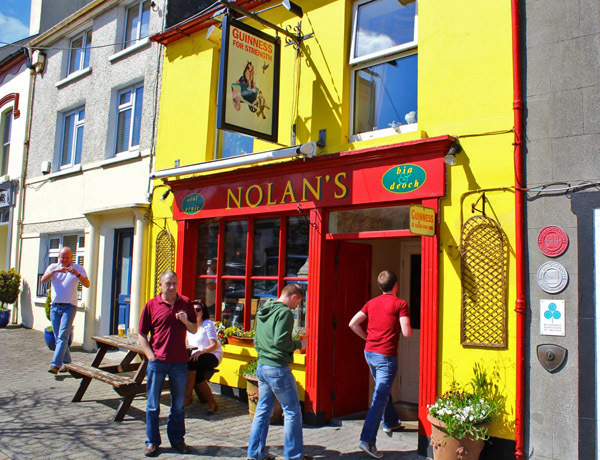 Today we travel from Clonakilty to Baltimore on the Wild Atlantic Way – deeper and deeper into West Cork! 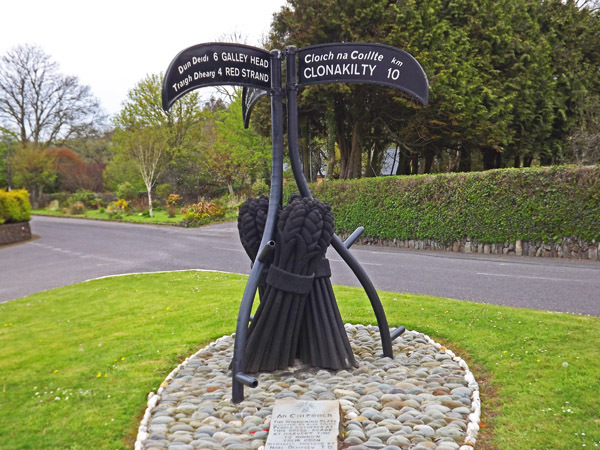 Leaving the town of Clonakilty on the Wild Atlantic Way, we skirt the coast on a series of small roads heading west. Lots of “ins and outs” as we make our way into what was Barry, Coppinger, O’Donovan and O’Driscoll territory many years ago. The small village of Rathbarry (guess which family that was named after) and the nearby Castlefreke overlooking Long strand are our first stops along the way. We called to Castlefreke many times over the years – it has been abandoned and falling into decay since the mid-20th century. Apparently the last title-holder was a nationalist who sold the castle at a fraction of its value in 1919 before heading for the USA. It is now being restored by one of his ancestors. Rosscarbery is quite an ancient village perched high above the main road. Hard to believe that this was a university town in the sixth century – and a major destination in Europe. The ruling family in the area up to the coming of the Normans in the 1200s were the O’Learys. 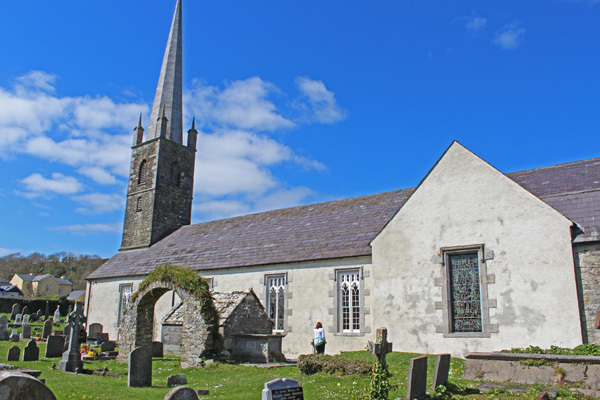 There is still a cathedral in the town, St. Fachtna’s – which is the smallest cathedral in Ireland, about the size of a typical church. This was the site of the University mentioned earlier from the sixth century. You can see an arch from an earlier building in the photo above. 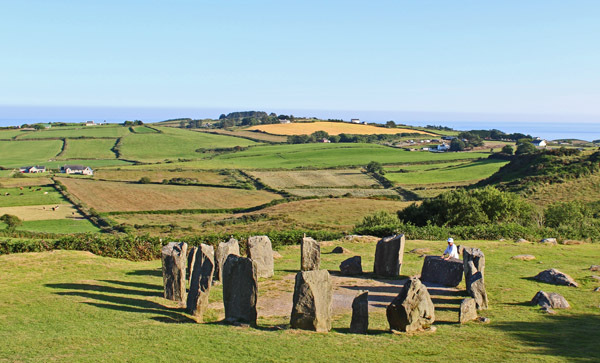 Continuing along the coast towards Glandore, we stopped in on Drombeg Stone circle. An amazing situation – and easy to get to. The site dates from around 1000 BC and although there are plenty of visitors, you are likely to find the place all to yourself! Just a few miles along the coast, you’ll start to skirt around Glandore harbour. This is a lovely little village – one that we visited ofetn with our children in the 90s for summer holidays. The other thing that you start to notice in these parts is the prevalence of many families of Anglo-Irish descent. Certain non-Gaelic names start to pop up in the census with regularity. This is mostly a feature of the coastal land and villages in West Cork as these were “planted” areas from the 1600s onwards. 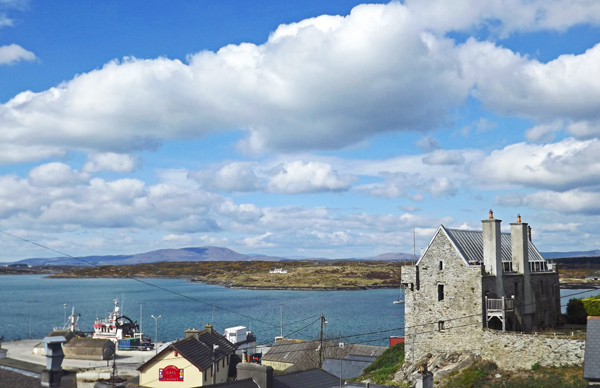 One example is when you reach the village of Castletownshend – given it’s name by the prevailing Townshend family. It always reminds me of a village that you might find in the south coast of England. 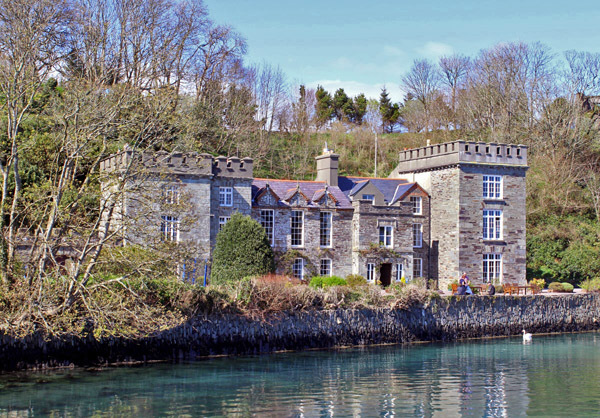 By the way – you can stay in that castle above, as it’s now open as a Bed and Breakfast. Nice location, isn’t it? This was also the home of Edith Somerville – one half of the Somerville and Ross team who wrote the Irish RM series of comic novels. Back to those Anglo-Irish names, If you look at the 1901 census in the area and take away the Irish Gaelic names, you will notice the following names in some quantity for the village and surrounding lands: Aylmer, Blackwell, Brickley, Burchill, Chard, Coghill, Easter, Fenwick, Goldup, Hilary, Jenkins, Minstrell, Mugford, Oliver, Richards, Ricketts, Sercombe, Somerville, Townshend, Vickery, Watson, Are any of your Irish family surnames here? 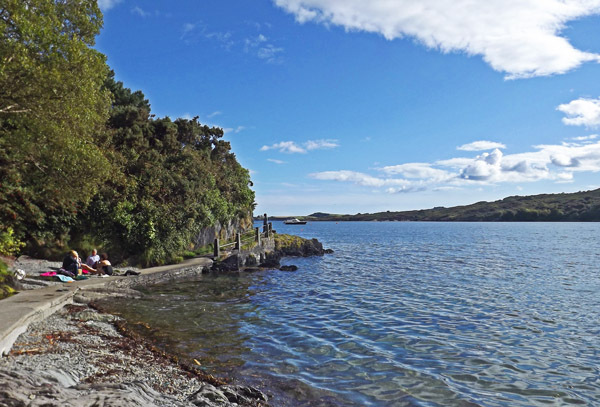 Beyond Castletownshend, its well worthwhile stopping off at Lough Hyne for a walk (and maybe even one the now famous moonlight Kayak cruises) – and before you know it you are heading through O’Driscoll country into the sea-side village of Baltimore. Baltimore received it’s name from Lord Baltimore (who also gave his name to the city in the USA – maybe they should be twinned!). 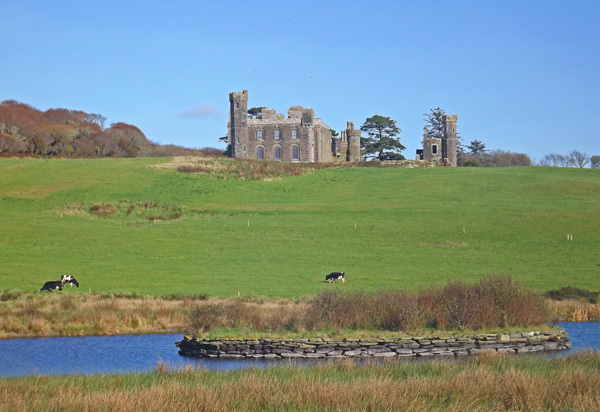 Funny thing is though, Lord Baltimore received his name based on family lands up in County Leitrim. Nothing to do with Cork or the USA. My own family of Collins were also prevalent in this area – the famous prayer went locally “….. but deliver us from the Collins’s, Amen” 😉 and many of my ancestors served their time as boat-builders in Skinner‘s boatyard on the pier at Baltimore. I must say, it’s nice to see the Castle fully restored and open to the public. Names associated with this area include: Bushe, Collins, Connolly, Cottrell, Davis, Donovan, Driscoll, Geany, Hallihane, Hegarty, Leahy, Kearney, McCarthy, Minihane, Neill, Nolan, Regan, Salter, Sheehan, Sheehy, Skinner, Sullivan, Sweeney, Taylor, Wholey, Young, Are any of your Irish family surnames here? 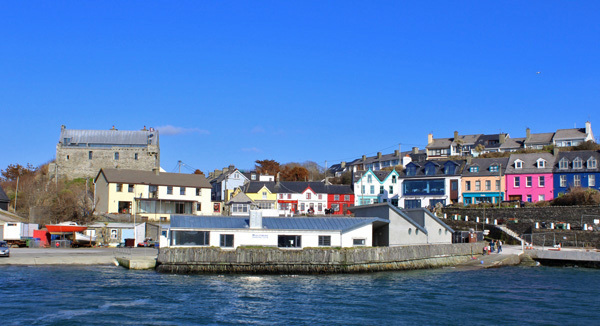 For the part of this leg of our journey – we leave land altogether and hop onto the short ferry crossing to Sherkin Island. There’s something about the habitable islands in Roaringwater Bay – Sherkin, Cape Clear (our next destination) and Heir – they are such peacful spots. Each a world of their own. 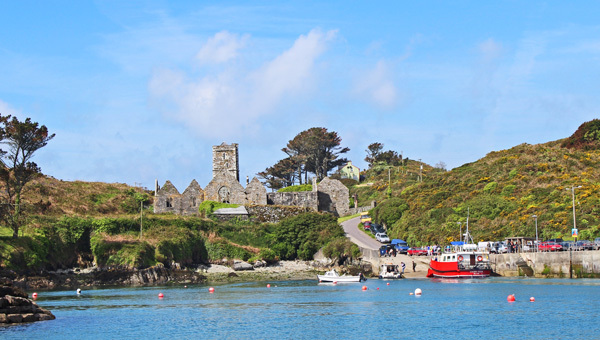 Sherkin is a great walking island – just a hop over from Baltimore with plenty of beaches and historical sites. Although, I just love wandering down it’s narrow, mostly carless lanes. 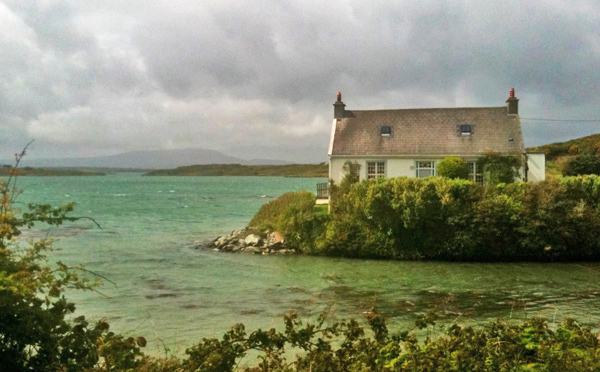 Always close to the sea, no matter where you are on the island – you come across sights like this on a regular basis. And then run like crazy to get the last ferry of the day back to the mainland because you’ve lost track of time! That’s the end of this leg of the Wild Atlantic Way. I do hope you’re enjoying the virtual trip as much as we enjoyed the real one. Do let me know below if you have any questions – or want to share your own experiences of this part of Ireland. 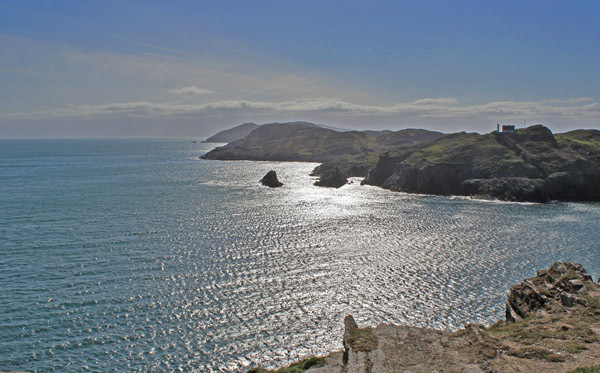 In the next leg of the Wild Atlantic Way – we head even further off-shore to Cape Clear Island. Do join us! Hi, Mike! Just to let you know that I was born in Baltimore, Maryland, USA! I’d love to have it twinned with Baltimore in Cork! I may write to the Mayor in the USA city and ask if they’d like to contact the city in Cork about hooking up together. What do you think? Sounds like a plan Patty – although Baltimore in Ireland is just a village! I’m delighted you like the tees – weel wear! Mike. About surnames,mine is Watson.I Am trying to find out what county or counties the two Watson undertakers were in?N.I.